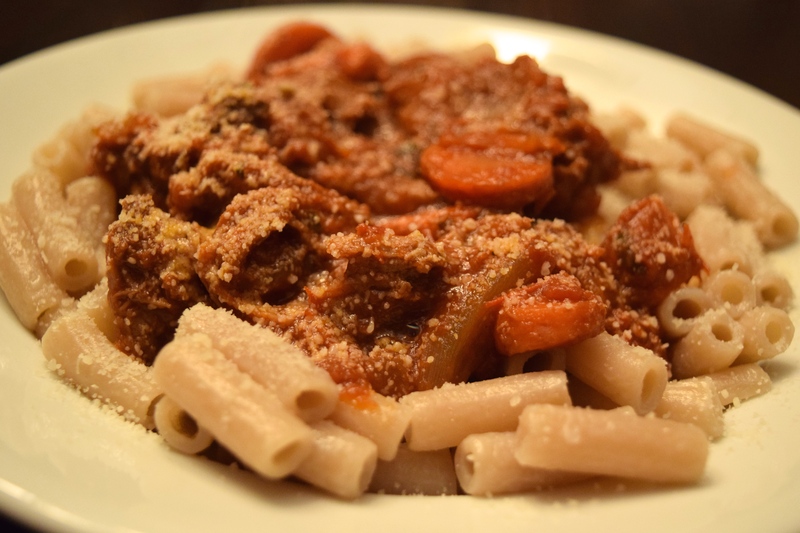 Braised Leg of Lamb Ragù with Carrots, Onion, Herbs & Red Wine Served Over Pasta. I love going to the Charlotte Regional Farmers Market to pick up fresh and local produce and meats. I went recently and got a leg of lamb. Gareth loves lamb, being Welsh and all (cue the lamb jokes!) so I waned to make something special with it. I’ve only made roast leg of lamb in the past, so this time I wanted to do something totally different. 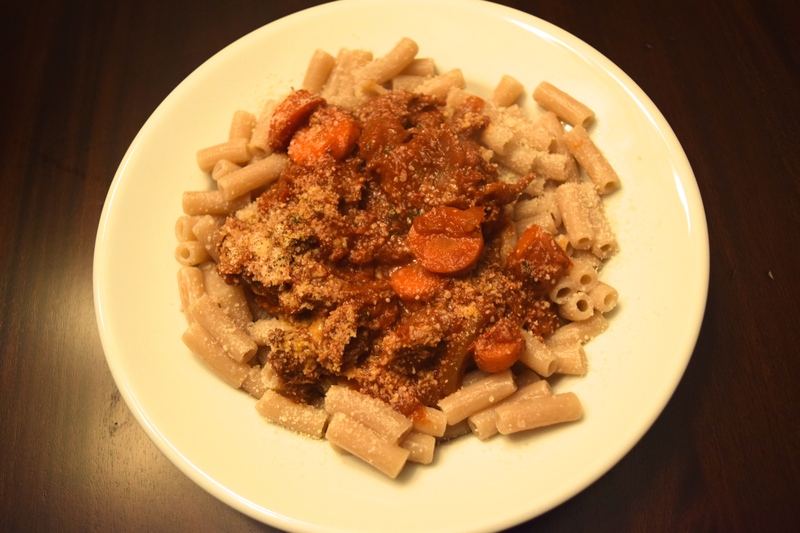 I browsed lots off different lamb recipes to get ideas, and decided to make a hearty lamb ragù over pasta. It turned out absolutely delicious. The sauce was rich and hearty with perfectly tender meat. It was a wonderful meal for a chilly winter night. Makes ~5 cups of sauce. Recipe is adapted from this recipe. Cut the leg of lamb into smaller pieces and trim off any excess fat. Heat a large, deep pan or dutch oven on the stove on medium/high heat. The pan needs to be deep enough to hold all the sauce and ingredients that will be added. Add the olive oil and chopped garlic. 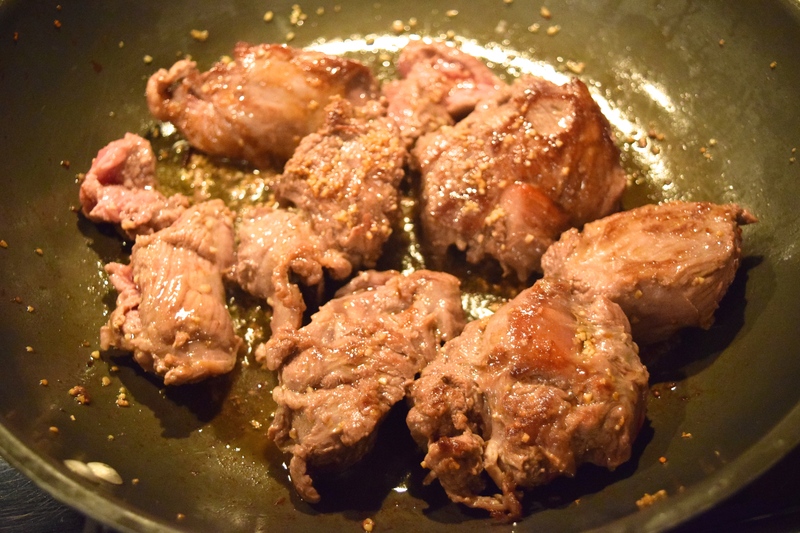 Once the oil is heated and the garlic is lightly browned, add in the lamb and cook each side for about 3 minutes. Once the outside of the lamb has browned, remove the lamb from the pan and set aside. Add the carrots, onion and parsley to the hot pan and cook on medium heat for about 8-10 minutes. 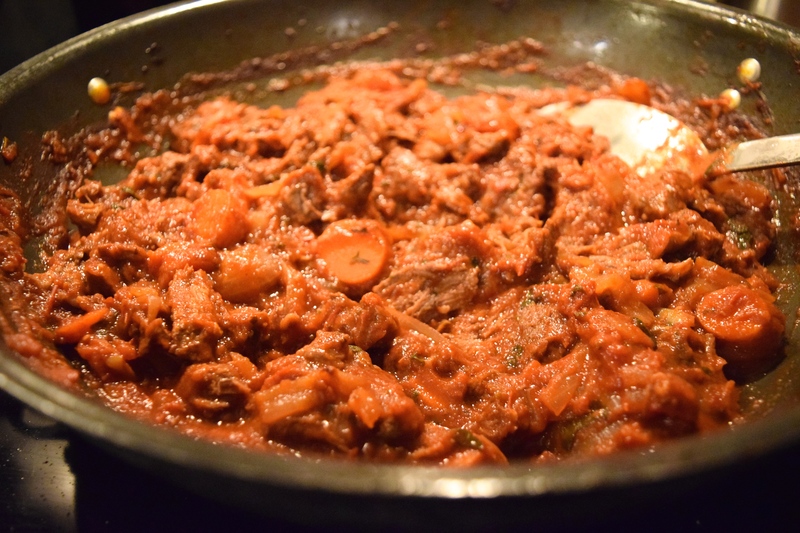 Once the vegetables have softened, add the lamb back into the pan and heat on high. Pour the red wine into the pan. Once the wine reduces by about half, add in the can of crushed tomatoes. Put the heat on low and season with a dash of sea salt and cayenne pepper. Put the lid on the pan and cook on low/simmer for about two hours. After the dish is finished cooking, remove the lamb from the sauce and use two forks to pull apart the lamb to create a shredded consistency. Once shredded, add the meat back into the sauce and stir well. Cook the pasta as directed on the package. 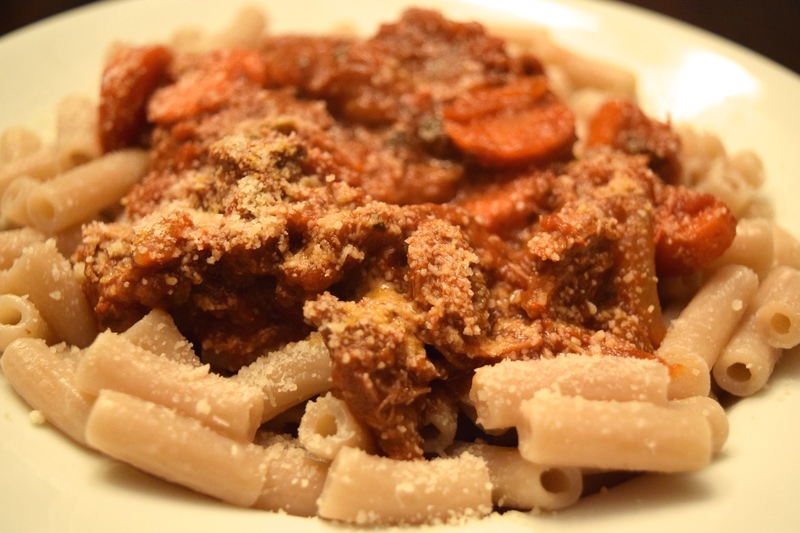 Once cooked, put a large spoonful of the ragù on top with a sprinkling of grated Parmesan. Looks delicious. I love lamb!